The Heritage Chief bike is made in Chicago. I prepared this list for another Chicago publication, but since they didn’t wind up having space for it in print, I thought I’d share it with SBC readers. One thing I learned from researching the piece is that, not counting the local cycling components giant (and Streetsblog sponsor) SRAM Corporation, there are a surprisingly small number of homegrown bike products in Chicago nowadays. Whether that’s due to higher commercial rents than other bike gear Meccas (hello Minneapolis), excessive city bureaucracy for small businesses, or other factors, it would be great to see more bike product businesses here in the future. If you’re looking for more transportation-related holiday gift ideas, check out the guides I did for Newcity magazine in 2012, 2013, and 2014. Some of the makers mentioned in those articles are now defunct (R.I.P. Kozie Prery bike caps) but others, such as South Side bike builder Legacy Frameworks, are still going strong. 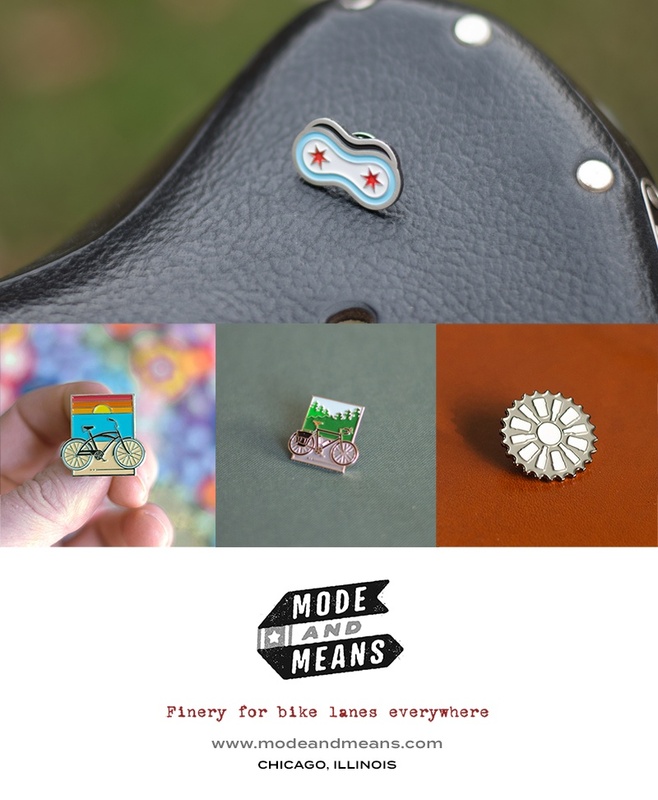 And — this just in — Bike Lane Uprising, a Chicago-based website for reporting bikeway blockages, is doing a two-week online pop-up shop, where you can buy shirts, patches and more with their nifty logo. The Po Campo Kinga bag. You can buy this useful facemask at any bike shop, but if you’re feeling crafty, the local Bike Winter website has DIY instructions. (bikewinter.org/fleece.) West Town Bikes will also be hosting a winter gear craft night, including balaclava construction, as part of their Women and Trans Night series later this month, tentatively on Wednesday, December 12, from 7-10 p.m. — keep an eye on their social media for confirmation. Are there any local sources for great biking, walking, and transit gear and gifts that aren’t mentioned in any of these guides? Let us know in the comments section. It is awfully weird that Chicago has such a small bike product scene. I think there are only two custom framebuilders in Chicago, which is a tiny number for a city of this size. I have no idea why, considering the city was a longtime center of bike production. There are definitely more than two custom frame builders locally. Chicago is a difficult place to keep a business open in for various reasons and I agree it’s a shame. As far as manufacturing, a lot of overhead costs are saved by locating outside of the city. Glad to see I was wrong about only two frame builders. But it is an unusually small scene. https://uploads.disquscdn.com/images/7a46558d820c883f019fbbadbdd6462e05b41dd83e0266ed6ba838c3f4754125.jpg My buddy and I recently started designing some bike-related enamel pins. These are glossy, but not reflective. While I think that’s a GREAT idea, I don’t think our supplier can accomodate — but I will certainly look into it! Re. Heritage Chief: What do Yankees have against fenders? Did it stop raining in Chicago entirely over the past few years? Please re-read the entry. What, is Alabama a fender hotspot or something? I meant the royal ‘Yankee’. European parlance to describe Americans in General; comparable to ‘Gringo’ or ‘Ami’. Not that bikes aren’t offered with fenders but rather how they are marketed and configured as ‘standard’. The U.S. market is still targeting ‘exclusive’ while Europe is ‘inclusive’. Fenders tie into this in an oh-so-little way it barely is worth the mention . . . but did so anyway. A huge generalization, I know, and a very ‘chicken and egg’ aspect. Even though I have not a ton of respect for Copenhagenize because he said that I am part of the problem due to the fact that I do wear spandex a few times a week, I think he is correct in how we, as cyclists, promote our lifestyle to make it appear as normal and cool as possible and the overall positive effects it has on our interests being taken seriously and ultimately getting more people out of cars. I dunno, I don’t think it’s weird given THE scene that seems to be predominant here. We have working class bike messengers but a lot of them are younger/generally ACTUALLY working class (POC, etc), so who can afford a Trash bag, and how many do you need to make locally to sell to people? As for frames, again, while there are a LOT of affluent bike people, as of this anecdata, they seem to be hyper focused in the roadie/suburban or might as well be suburban jock arena of bike tribes. They don’t want custom, local things because that’s not within their arena and Rapha probably has enough prestige? There are a lot of beautiful things out there for cyclists, but they are very expensive and people here just don’t seem interested when Trek or Rapha or whomever has their needs met. I don’t mean it as a value judgement, but the push and pull of trying to put more people on bikes means that places with higher concentrations of a certain type of cyclist might have more of that stuff (Minnie, Portland, Seattle, etc etc.) Also, jesus, have you seen how much a Peacock Groove frame or Duluth Pack costs? Honestly. On the other hand: lol SRAM local, you think they’re building those groupsets in Gary? C’mon, SBC. “***not*** counting the local cycling components giant (and Streetsblog sponsor) SRAM Corporation.” SRAM is, in fact, a local company. We can always count on hopeyglass for unwarranted snark! aw, shoot, unwarranted snark? I suppose I’ll have to join the other monsters under the SBC bridge. But honestly, I mostly just try and point this out because I think we can take a lot of pride in SRAM being a local/regional company (hey there, Indy) but more and more I also think it is super important to think about what humans are involved in the industry around biking as a commuter or for recreation or for athletic purposes, and are things under the bike industry umbrella feasible as an economic development driver in our region. Lynda’s incredibly thoughtful and nuanced take on winter commuting is a great example of exploring different angles and from all aspects of humanity involved in using a bike for all purposes. I threw my own thoughts into the picture of the lack of truly local bike/accessory production outfits in the area, which seemed to be a problem for this article, no? More questions: What do the corporate/office employees of SRAM West Loop get for their bike friends for Christmas? How does West Town’s Girls Bike Club make such good spa stuff for their fundraisers? Anybody making jewlery or ornaments out of old metal bike junk (I believe lots of folks USED to do this)? I dunno I think a lot of things and ask them on the internet. Also, why else hang out in a comments section then to provide peanuts from a gallery? As Nelson says, gotta snark something. TRUE – there are still folks in Chi making jewlery and bags. What about Alexis Ellers @bummercitystudio? She’s been making both hip pouches and recycled parts jewlery for years. Due to anchor bolt supply problems only about 150 racks were installed this year, and the department is giving up on Chicago's iconic black powdercoated racks.